I looked at my plants in the greenhouse this spring  and realised that things had to change. There were too many plants, some quite tatty, many appearing tired and not flowering much. Then there was another consideration; they had invaded our house: the bathroom, two bedrooms, and the kitchen. Radical action was required. I decided to have a ‘spring clean’ and remove 20-25% of my plants, either to the compost heap, sales table, or for propagation according to their condition. This included my cacti, succulents, orchids, bulbs, bromeliads and cycads. I figured some readers might have the same problems so I decided to write this piece to inspire you to inspect your plants critically and look after them as well as you can. 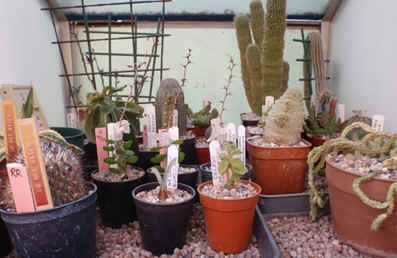 As I write this during May most of the sorting out is complete; there is more repotting and outstanding propagation tasks on the agenda. My 14x8ft (3.6x2.4m) Crittall greenhouse was erected in 1980 and does show its age. I have replaced some glass, but presently it is weatherproof, bar a few slight leaks and drips in heavy rain caused by moss growing close to the glazing bars. It is fitted with Papronet internal shading, six automated roof vents and four low-level automated louvre vents. To maintain air movement in summer two fans run during daylight hours. In winter it is heated with a 3kW BioGreen open flame natural-gas heater and 1.5kW electric fan heater as back-up. I aim to maintain 8C at bench level, though it can be much colder at floor level so I fitted soil warming cables to reduce the risk of frost damage to those plants growing under the staging. I might yet install twin-skin polycarbonate in the roof vents and door to improve thermal efficiency in winter. I run a ‘hot box’ (from Two Wests & Elliott) where my Asclepiads and Monadeniums live all-year-round as well as operating as a ‘hospital’ for newly grafted plants. (Yes Tina you can see some Alluaudiopsis marnieriana grafted on Alluaudia procera for you). I also have a propagator for seed raising and establishment of cuttings. I grow some thirty Gasteria plants under the staging in the shadiest north-west corner and they seem happy there and flower well. I also grow most of my Aloe species and miniature hybrids under the bench on the opposite sunny side; they have additional under bench horticultural fluorescent lights switched on during the day all-year-round. The waterproof fittings and special-spectrum tubes came from Two Wests many years ago. The arrangement of under-bench lighting also enables me to keep some Euphorbias under the bench as part of my efforts to multiply Viscum minimum the hemi-parasite I acquired from Keith Grantham’s collection in 2001. I have reserved a sunny under-bench corner for South African bulbs, mainly Haemanthus, Scadoxus, and Eucomis as well as a few Hippeastrum and an old Clivia. I no longer grow a broad range of Zephyranthes, Habranthus and Lachenalia bulbs: I decided to constrain the number of different growing and watering regimes needed to keep such a broad spectrum of plants performing at their best. While some bulbs can tolerate a degree of neglect, many need to follow a quite specific rhythm of treatment to flower well and thrive for many years. Top: A general view showing fans and cans! Above: My hotbox with Pseudolithos migiurtinus in flower to the right . 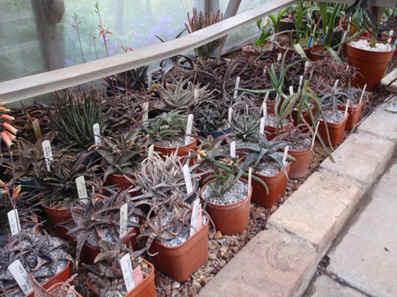 Below: A selection of smaller Aloe species and hybrids growing under the staging. The sunniest (south-west facing) sand bed is reserved for a few taller Cerei, including a Pachycereus I grew from seed and an old 6ft (1.8m) Cleistocactus strausii that bears a few flowers every year. There is now competition for that space by the few Agaves I grow. Time will tell which plants win! Above them on two sunny shelves fitted to the end wall opposite the door are my Ariocarpus and Sarcocaulon plants, both of which appreciate the high light-levels. Above: Cleistocactus strausii Right: Epiphytes and Tillandsias hang from the roof. I reserve under-bench space at the north-east (door) end for propagated plants before they are banished to the cold-frame ready for Branch sales. There is space competition outside the greenhouse as I need cold-frame space for lilies and Lampranthus pots that inhabit our patio during the summer. On the north-west side I have a conventional soil bed enriched with peat and coarse bark for Cycads in pots I germinated twenty years ago. I do have to watch out for ants as they like to build nests in the cycad pots. 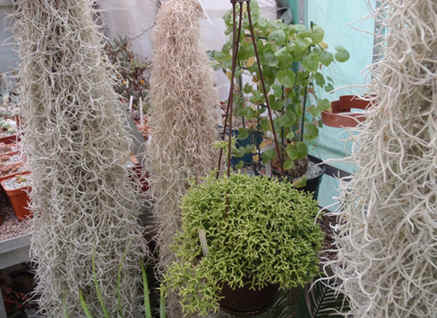 Above the soil bed there are epiphytes including Tillandsia usneoides and Rhipsalis plants in hanging pots. A large caudiciform Ipomaea platensis produces metres of annual growth scrambling along wires and smothered with pink flowers each lasting one day in the mid-summer to autumn seasons. You might be aware that I do like mesembs ... a lot! 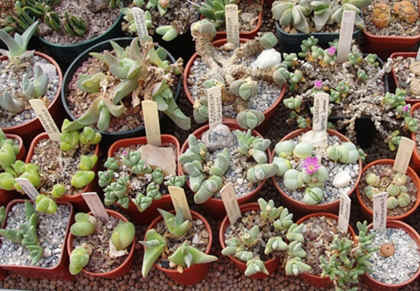 I grow mostly Lithops and Gibbaeum with other plants of both stemless and low-shrub type genera. 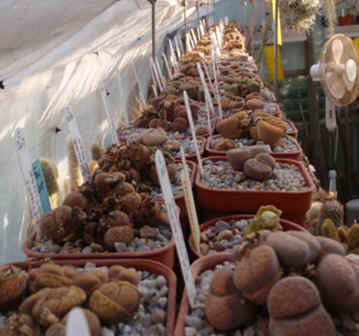 The one-hundred plus Lithops occupy a long shelf on the south east side, with some aberrant colour forms and a few cultivars sharing the western corner bench top with the other members of the family. 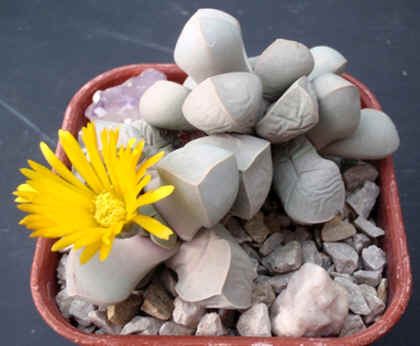 Two favourites from amongst the stemless mesembs that reward me with flowers every year are Conophytum friedrichiae and Lapidaria margaretae. Both are easy to grow in gritty compost and modest watering. In fact there are some flowers out during most months of the year in this area owing to the different growing seasons of particular mesemb genera. I do try to water carefully and observe resting periods, but most plants in small pots appreciate being sprayed when at rest to reduce very significant shrivelling. It seems to work for me, though I expect others may disagree. 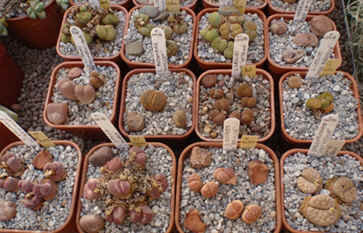 Left: The Lithops shelf and below are some aberrant colour forms. The all-year spraying treatment also works for Sarcocaulon (now Monsonia) that live on the shelf above the mesembs; indeed if you allow them to dry out completely and the roots to desiccate they seldom resume normal growth. In my experience even the most strenuous attempts with rooting hormone powder, warmth and wetness are doomed to disappointment. I consider that particular genus to be a real wonder of nature: adapted to live in a hard desert and yet they have quite large, beautiful, papery-petalled flowers. I ejected around 150 plants this spring and now have roughly 350 succulents, 250 cacti and some 50 others (mainly bulbs and cycads) in the greenhouse. 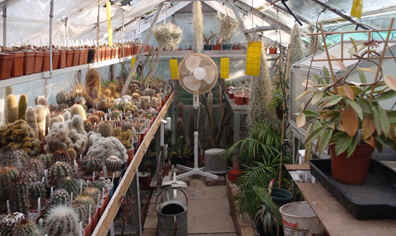 Most of my bromeliads live in the house, only the spikiest Dyckias and Dueterochonias plus my festoons of Tillandsia usneoides are in the greenhouse. 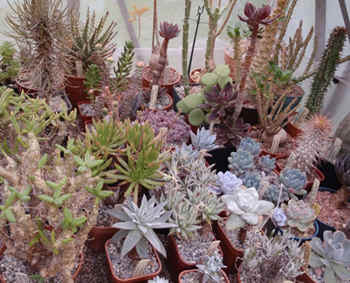 The cacti occupy most of the south-east staging with a few succulents at the southern end; they are a mix of Alluaudia, Euphorbia, Dudleya, Sedum, Tylecodon and other caudiciforms like Pterodiscus. 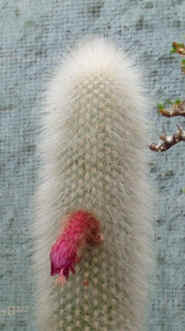 I do have some cacti I grew from seed or acquired during the 1960s. Two venerable Mammillarias flower every year; I won the M. scrippsiana in a raffle at a CSSGB meeting at the RHS Hall in London during 1967. I grew many plants from seed, but this year I have selected only the best to keep. I also discovered many duplicates during my spring clean; some I retained as they showed contrasting attributes of a particular species, others were discarded because they were damaged, poor flowerers, having weak spination, or with no interesting features. 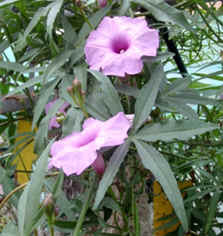 I grow some cristate plants and try to grow the normal forms of the species as well. Some of our speakers have inspired me to focus on particular genera following their presentations. For example I have a few Espostoa plants grown from habitat collected seed by Graham Charles and I have looked carefully at my Thelocactus plants following Martin Doorbar’s presentation to us earlier this year. My interests have varied throughout the past fifty years and I expect they will continue so to do. 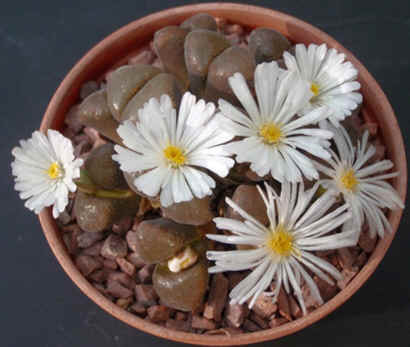 However a few particular favourites have sustained my interest throughout the period: notably Lithops (as already highlighted) and Neoporteria (now Eriosyce). Copiapoa plants now just outnumber the Neoporteria plants, but they are both wonderful genera; slow growing, with very ornamental body colour, nice spines and (collectively) they bear interesting flowers of various colours. 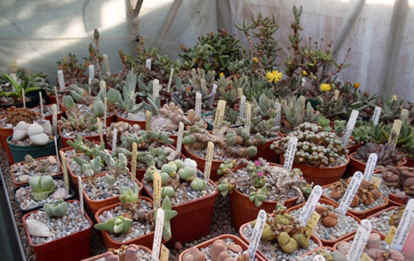 I used to grow more Gymnocalycium species than I have room for now, but I have some nice large old plants and a few smaller favourites such as G. megatae, G mihanovicii and G. ragonesei. I find them harder to grow well than many other cactus genera, though my bête noir is Echinocereus. I cannot get on well with them so I have two left only, for now! I keep some Echinopsis hybrids for their fleeting flowers and a few Rebutias. I have accumulated a modest collection of sixteen Turbinicarpus that will never grow me out of house and home, though the presumed hybrid ‘X Lophoturb’ dwarfs its true species cousins. Is it an allopolyploid or what? It has not set seed so I presume it is not self-fertile. 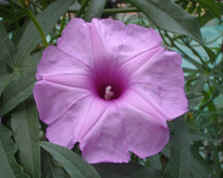 By contrast the species flower sporadically throughout the spring and early summer. 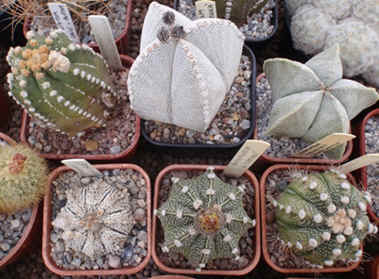 I canno t finish without mentioning the genus Astrophytum. (left) They are rightfully described as easy to grow from seed and ideal beginners’ plants. Oh yeah; try keeping them unmarked for forty-plus years. It is true that they are mostly quite forgiving and they do flower very well as I have said before in this magazine, but Astrophytum asterias is a temperamental species. I freely admit here that I do not appreciate the Astrophytum/Digitostigma ‘thing’ or the newest grotesque monstrose and variegated forms from the Far East. Maybe I will change my mind sometime in the future? I doubt it! I hope I have inspired you to really look hard at your plants, weed out the poor performers and understand why they are poor. This should improve your collection and remind you not to squeeze too many plants into a restricted space as I have done over the past few years! Ed: Thanks Roland and who would have thought that Mrs Dell would confuse megatae (as in the Gymno) with megadeal? Roland has raised some interesting points here. What do we do when GH space is finite and plants keep growing?